Rich is the assistant director of Academic Technology Department in the College of Arts and Sciences at Suffolk University. Suffolk University is located on Beacon Hill in the heart of the city of Boston. Before working full time, Rich worked as a lab assistant in the lab his department is managing starting a day after graduation in May 2001. Rich also went to Suffolk with another member of the FA team, James Buono. Rich also has worked at the Winthrop Pizza Center since senior year in high school. Many members of the FA Project team visited there through high school and college. The Pizza Center and the “Pizza Princess” support the team and those afflicted with FA. Rich grew up in Winthrop, MA, where he met Richie Currier and his future wife Maria on their Little League team, the “B” Red Sox. As many of you know, when Rich and Richie are together, Richie can’t help but tell the story that will forever link the two of them. When Richie was in the on deck circle, he was trying to time his swing with the pitcher for the other team, he managed to let go of the bat, and threw it off of Rich’s dad’s new car! The rest of Rich's free time is dedicated to his other love - candlepin bowling. In 2009, Rich approached the FA Project about a fundraiser idea - a night to bowl with the pros. After connecting with the FA Project, The Pro Series, and one of the FA Project's biggest supporters, Carol from Candlewood, the rest is history. 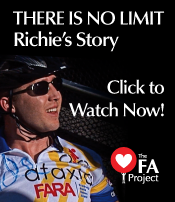 Rich currently resides in Winthrop, MA with the love of his life, Anna, also a member of the FA Project. As event director of the annual bowling fundraiser, Rich’s role is to make each event bigger and better than the year before and to spread the word for a good cause to end those suffering with FA. You can connect with Rich any time at rlimone@thefaproject.org.